Sign up to get The Update emailed to you on the first day of each month! Conshohocken Physical Therapy has joined forces with Good Shepherd Penn Partners to open Penn Therapy & Fitness Conshohocken. This was made official on December 7th, 2016 when Conshohocken Physical Therapy was acquired by Good Shepherd Penn Partners. This site offers the clinical expertise of Desirea D. Caucci, PT, DPT, OCS, co-founder of Conshohocken Physical Therapy along with five additional clinicians that have been treating patients in the Montgomery County for over 11 years. Desirea is now the site manager for Penn Therapy & Fitness Conshohocken. Our newest clinicians bring expertise in the treatment of orthopaedics, movement disorders, sports performance and vestibular/balance disorders, in addition to aquatic therapy. Learn more about our newest outpatient site! Winter weather comes with its own set of provisions that patients with lymphedema(or a risk of lymphedema) should be mindful of to protect themselves! For patients who are at risk for lymphedema there are proactive precautions to protect themselves. And for patients that already have lymphedema, there are also things those people can do to reduce their risk of a "flare up", or the condition getting worse. Rebecca Golden, PT, LANA-Certified, at Penn Therapy & Fitness Cherry Hill shares how patients with lymphedema can be proactive in managing their symptoms during the winter months. For the acute therapists at Pennsylvania Hospital's intensive care nursery (ICN), patient care begins at birth. The ICN offers the highest level of care for sick and premature infants. Physical therapists, occupational therapists, and speech language pathologists work together to provide care for infants as well as their parents during their ICN stay. Over the past three years, the level of care and support the acute care team provides has expanded from a two-person team of a physical therapist and a speech language pathologist, to four members-including an occupational therapist making Pennsylvania Hospital's ICN a comprehensive interdisciplinary rehabilitation team, which is rare in this field. "Being part of research that has a direct impact on such young lives gives us a feeling of accomplishment and makes us proud of the work that we do," says Jenna Rogers, PT, DPT. "It's an amazing feeling to see parents become comfortable holding and feeding their babies and knowing we are making a difference." Read more about the impact of our ICN therapy team. Below is information about our Combined Support Group for January 2017. Through our special Combined Support Group, we provide education and encouragement for patients recovering from spinal cord injury, amputation, aphasia, brain injury, medically complex conditions and stroke. 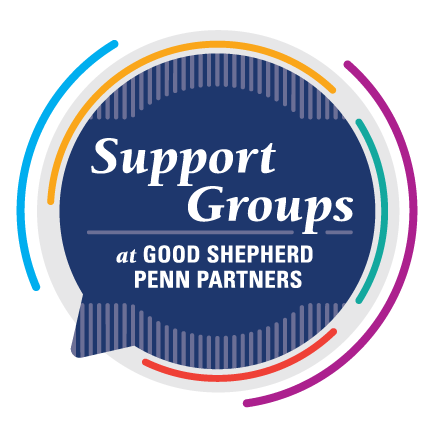 All of our support groups are open to the public and take place at our Rittenhouse Campus. Please join us as Lynn Fisher from the Philadelphia Office of Emergency Management presents tips for staying safe at home and strategies to prepare for unexpected emergency situations.